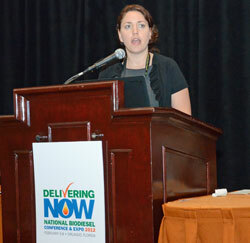 The last day of the 2012 National Biodiesel Conference featured a first ever Sustainability Symposium. A lot of attendees stayed for this event. Getting us started was Rachel Burton, Piedmont Biofuels. Rachel also introduced the keynote speaker, Stephen Kaffa, California Biomass Collaborative. I spoke with Rachel before things got started to learn more about the Sustainability Symposium. She says the purpose is to connect with members and stakeholders about the current state of affairs with sustainability within the biodiesel industry. The symposium is taking a look at all the various aspects of sustainability that impact the industry.